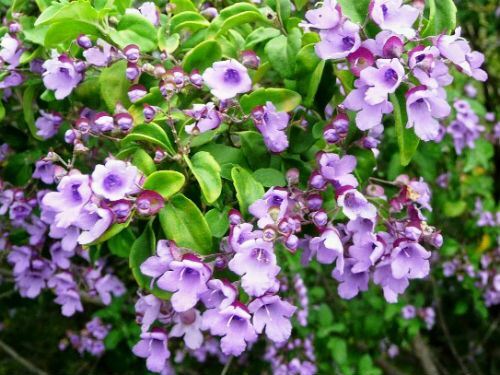 Prostanthera melissifolia is known as the Balm Mintbush. The species may reach a height of five metres with a spread of three metres. The mature specimens, in our cold climate garden, are about four metres tall with a spread of two metres. Leaves are oval, about three centimetres long, aromatic with toothed margins. They are crowded, dull green above and paler beneath. The flowers are mauve, one centimetre long and carried in terminal racemes. Blooms are both conspicuous and profuse during the spring flowering period. Light pruning after flowering is appreciated. Growth habit, foliage and flowers are all attractive features of this tall Mintbush. We grow the species, as a background shrub, in our dense shrubberies. Prostanthera melissifolia is a native of Victoria where it is found, as an understorey shrub, in eastern mountain forests. Prostanthera lasianthos occupies a similar environmental niche. Cuttings produce roots quickly and enthusiastically. The species name means with leaves similar to Melissa (Balm), hence the common name.